Earn up to 5 Vaportiser Loyalty Points. New Element NS20 Salt Nicotine 10ml Offers “Max Nicotine” Option, Fulfilling Vaper Demand And Traditional Cigarette Smoker Appeal. 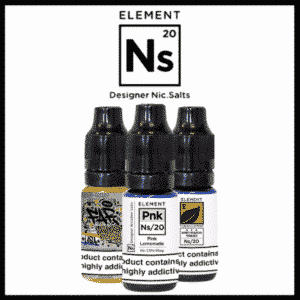 Element E-Liquid has released its newest addition to their award-winning vape liquid collection, known as Ns20. A revolutionary new salt nicotine, Ns20 boasts a 20 mg nicotine content, making it the highest allowable in the EU. TPD compliant and available in 10 ml across the company’s top-selling Premium Dripper, FAR, Emulsions and Tobacconist lines, Ns20 is primed to become Element’s best e liquid release to date. Entirely versatile, Ns20 can be used with any vape mod, from the traditional “mouth to lung” to a sub-ohm tank setup, making it a highly sought after addition to capitalize on demand and reach within existing as well as emerging markets across the EU. With a dominant VG to PG ratio, this innovative nicotine salt juice rivals nicotine levels found in traditional tobacco cigarettes while maintaining an incredibly smooth draw. No longer will vapers have to endure less than desirable nicotine effectiveness, thus, a less than satisfiable nicotine experience. 555 Tobacco by Element NS20 is a tobacco flavoured e-liquid with hints of vanilla, walnut, hazelnut and caramel combined together with salt based nicotine. Honey Roast Tobacco – An e-liquid from the Element NS20 range which contains a mixture of tobacco, nuts, vanilla and caramel flavourings. Crema – Element NS20 Cake rolls, eclairs and tiramisu, this is the sweet and creamy filling that makes Crema so damn delicious. An all day vape that you need to vape if you haven’t yet. Fresh Squeeze – An e-liquid from the Element NS20 range which contains orange flavourings. Key Lime Cookie – An e-liquid which is from the Element NS20 range which contains a mixture of cookies and Lime flavourings. Pink Lemonade – An e-liquid from the Element NS20 range which has pink lemonade flavoured liquid from Element. Watermelon Chill – From the Element NS20 range of e-liquids, this bottle contains a mixture of which is a mixture of Mint and Watermelon flavourings. Candy Punch – Part of their “Designer Nic Salts” range, this Element NS20 flavour comes in an e-liquid pod and contains the flavours of Candy. Grape Vape – Part of their “Designer Nic Salts” range, this Element NS20 flavour contains grape flavourings. Neon Green Slushie – Part of their “Designer Nic Salts” range, this Element NS20 flavour contains the flavours of Lime Slushie and Menthol.